Surgery for subacromial impingement syndrome is often performed in working age and postoperative physiotherapy exercises are widely used to help restore function. A recent Danish study showed that 10% of a nationwide cohort of patients retired prematurely within two years after surgery. Few studies have compared effects of different postoperative exercise programmes on shoulder function, and no studies have evaluated workplace-oriented interventions to reduce postoperative work disability. This study aims to evaluate the effectiveness of physiotherapy exercises and occupational medical assistance compared with usual care in improving shoulder function and reducing postoperative work disability after arthroscopic subacromial decompression. The study is a mainly pragmatic multicentre randomised controlled trial. 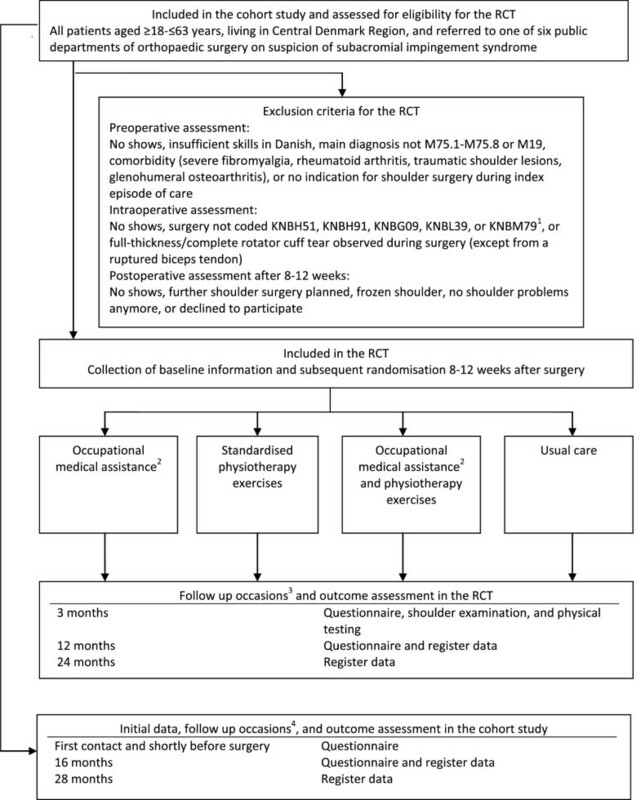 The trial is embedded in a cohort study of shoulder patients referred to public departments of orthopaedic surgery in Central Denmark Region. Patients aged ≥18–≤63 years, who still have shoulder symptoms 8–12 weeks after surgery, constitute the study population. Around 130 participants are allocated to: 1) physiotherapy exercises, 2) occupational medical assistance, 3) physiotherapy exercises and occupational medical assistance, and 4) usual care. Intervention manuals allow individual tailoring. Primary outcome measures include Oxford Shoulder Score and sickness absence due to symptoms from the operated shoulder. Randomisation is computerised with allocation concealment by randomly permuted block sizes. Statistical analyses will primarily be performed according to the intention-to-treat principle. The paper presents the rationale, design, methods, and operational aspects of the Shoulder Intervention Project (SIP). SIP evaluates a new rehabilitation approach, where physiotherapy and occupational interventions are provided in continuity of surgical episodes of care. If successful, the project may serve as a model for rehabilitation of surgical shoulder patients. Subacromial impingement syndrome (SIS) is an important cause of ill-health with a prevalence of 2-8% of the working population [1, 2]. When non-surgical treatment fails, surgery may be chosen [3, 4], and most often subacromial decompression is performed. Substantial increases in rates of surgical treatment of SIS have been reported from Sweden , the US , the UK , and Denmark . In Denmark, a level of 0.15% of the working age population was reached in 2008. Although high proportions with successful outcomes have been reported, around 20% of the patients experience chronic shoulder pain and/or disability after surgery [9, 10]. In Denmark, 10% of employed patients leave the labour market within two years after surgery due to health related disability . Considering the fact that exercise therapy is widely used to help restore shoulder function after surgery (Christiansen et al., submitted, [11, 12]), few randomised controlled trials (RCTs) have compared effects of different postoperative exercise programmes [13–16]. For musculoskeletal disorders, current evidence indicates that workplace-oriented interventions may be effective to promote work retention [17, 18]. The majority of studies have focussed on low back pain [17, 18], but different disease-specific risk profiles indicate that low back pain and upper extremity disorders may need different interventions . Although work disability may lead to a poorer quality of life and loss of social identity , usual care of surgical shoulder patients does not focus on job retention as an important outcome, and to our knowledge, workplace-oriented interventions to promote work retention after subacromial decompression for SIS have not been evaluated. The study is a mainly pragmatic multicentre RCT . The RCT is embedded in a cohort study, which comprises all patients aged ≥18–≤63 years who are referred to one of six public departments of orthopaedic surgery in Central Denmark Region on suspicion of SIS in a three year period, 2011–2014. Figure 1 presents the inclusion of patients and the stages of the RCT. The physiotherapy intervention will be evaluated for patients with and without paid work. The occupational intervention (and the physiotherapy intervention) will be evaluated for the subgroup of patients, who have paid work for at least 25 hours per week, using a factorial design [22, 23]. Table 1 presents variables in the RCT and in the cohort study, in which the RCT is embedded. After randomisation, the patient is seen by an occupational physician from the research team, who assesses the patient’s work instability using a gold standard approach . Work instability is characterised by a mismatch between an individual’s functional capabilities (in this case shoulder function) and job demands (in this case biomechanical shoulder load) to an extent where job retention is threatened . Shoulder function is assessed by clinical examination and shoulder load is assessed using a job exposure matrix (JEM), both combined with a semi-structured interview. Depending on the degree of work instability, a three month action plan is constructed. The plan is attuned to the patient’s most important barriers against continuing or resuming work, in agreement with the biopsychosocial model [25, 26]. A workplace visit is necessary to assess work instability. Yes, shoulder load has to be assessed. At three months, Constant Score will be used as a secondary outcome measure for the physiotherapy intervention [31–33], and OSS will be used as a secondary outcome measure for the occupational intervention to evaluate any deterioration. For both interventions, the Fear Avoidance Belief Score, modified to focus on the shoulder  will also be used. Furthermore, the physiotherapy intervention will be evaluated using the sickness absence percentage for the subgroup in paid work for at least 25 hours per week. Trial results will be reported as a summary of the outcome measures in each group together with the estimated effect size and its precision. Statistical analyses will be performed according to the intention-to-treat principle, which will be supplemented by per protocol analyses depending on the proportion who do not receive the intended treatment. For outcomes measured using an essentially continuous scale (e.g. OSS, sickness absence percentage, and transfer income percentage), differences between groups at follow up will be compared by means of linear regression modelling with appropriate transformation of dependent variables. Analyses of effects of the physiotherapy intervention will be adjusted for centre (department of occupational medicine), for the occupational intervention (no, yes, irrelevant), and for the outcome measure at baseline. For the subgroup, who are in paid work for at least 25 hours per week, a two-by-two factorial design will be used. The analyses will focus on main effects of the occupational intervention, but cell-by-cell results will also be reported [22, 23]; the analyses will be adjusted for centre. Numbers needed to treat for one patient to benefit from the interventions will be calculated . In addition to main RCT results, supplementary analyses will be performed using variables presented in Table 1. The few studies that have compared the effect of different postoperative exercise programmes have focussed on the initial 4–12 weeks and have targeted all patients after decompression surgery for SIS [13–16]. We chose to start our interventions 8–12 weeks after surgery, where the six orthopaedic departments that contribute patients to SIP routinely schedule postoperative control, and where we thought that we would be able to target our efforts on the subgroup of patients with continuing shoulder problems and an increased likelihood of chronic disability. Any problems regarding work retention would also be crystallised at this time, where unrestricted activities are usually allowed.